Spatial analysis, geographic information systems, design and implementation of interactive databases and websites, data visualization, environment and conflict, natural resources and conflict. Lars Wirkus started his academic career with studies on base conversion. Then, his research extensively focussed for many years on natural resources and violent conflicts, institutional aspects of water resources management, the micro level analysis of water resources-related conflicts and climate change. From 2007 to early 2011, Lars worked on a part-time basis as Senior Researcher with BICC and as a Research Associate with the United Nations University–Institute for Environment and Human Security. 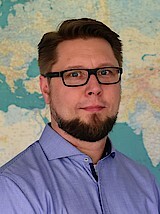 Having taken on the position of Head of Data & Geomatics at BICC in 2011, Lars’s focus has since been on developing and implementing various interactive databases- and WebGIS-based knowledge-sharing information applications on topics such as arms exports, small arms control, physical security and stockpile management, global militarization, war & peace and refugee research. More recently, he has started to research the potential and limits of remote sensing approaches for analyzing and monitoring peace and conflict. Wirkus, L., & Vollmer, R. (Eds.). (2008, July). Monitoring Environment and Security: Integrating concepts and enhancing methodologies (Brief series No. 37). Bonn: BICC. Wirkus, L. (2006, January). Water, Development and Cooperation — Comparative Perspective: Euphrates-Tigris and Southern Africa (Paper series No. 46). Bonn: BICC.